337 Beacon is located on the south side of Beacon, between Exeter and Fairfield, with 335 Beacon to the east and 339 Beacon to the west. 337 Beacon was designed by architect Samuel D. Kelley and built in 1881-1882 by Frank Jones, mason, for building contractor Samuel Tarbell Ames for speculative sale, one of three contiguous houses (333-335-337 Beacon) of the same design with three story (plus basement) front bays on the eastern side. Samuel Ames is shown as the owner on the original building permit application for the three houses dated October 15, 1881. At about the same time, Samuel T. Ames had two additional houses built to the west, at 339-341 Beacon, also designed by Samuel D. Kelley in a similar style but with front bays extending one less story. 333-335-337 Beacon were built on land purchased in several transactions by Samuel T. Ames’s son, Harvard law professor James Barr Ames. On October 27, 1881, James B. Ames purchased a six inch strip of land from Carrie E. (Ellis) Evans, the widow of Franklin Evans, who had purchased it from the Commonwealth of Massachusetts on April 27, 1880. The land included the western half of the party wall with 331 Beacon, and acquiring it permitted Samuel Ames to begin construction of 333 Beacon. James B. Ames held or acquired the right to purchase the remainder of the land for the three houses from the Commonwealth, but did not complete the transactions until after the houses were constructed, taking title to a 24.5 foot wide lot for 333 Beacon March 7, 1882, and a 49.8 foot lot for 335-337 Beacon on September 21, 1882. Click here for an index to the deeds for 337 Beacon. On September 30, 1882, 337 Beacon was purchased from James Barr Ames by Charles R. Evans, a real estate dealer in association with his father, Brice Shepard Evans. One week later, on October 6, 1882, he transferred the property to his father. A widower, Charles Evans had remarried earlier in September of 1882 to Henrietta Thompson. Prior to their marriage, he lived at 80 Chester Square with his parents, Brice Evans and Sarah Maria (Cummings) Evans. After their marriage, they may have briefly lived at 337 Beacon. By 1884, however, they lived at 161 West Chester Park. On November 2, 1883, 337 Beacon was acquired from Brice S. Evans by his brother-in-law, Benjamin S. Brown, the husband of Ann Elizabeth (Evans) Brown. He was a farmer in Deerfield, New Hampshire. 337 Beacon was not listed in the 1883-1886 Blue Books. On November 6, 1885, 337 Beacon was acquired from Benjamin Brown by Annie M. (Howe) Mills, the wife of William N. Mills, a barrel stave and cooperage dealer. They previously had lived at 321 Beacon. William Mills died in June of 1894. Annie Mills continued to live at 337 Beacon until about 1896, but moved thereafter. She continued to own 337 Beacon and lease it to others. By the 1896-1897 winter season, 337 Beacon was the home of Stephen Long Bartlett and his wife, Florence (Ricker) Bartlett. They had married in June of 1895, after which they had lived at the Hotel Brunswick (southeast corner of Boylston and Clarendon) before moving to 337 Beacon. Stephen Bartlett was an importer of cocoa and chocolate. They continued to live at 337 Beacon in 1901, but moved thereafter to Chestnut Hill. On January 8, 1903, 337 Beacon was acquired from Annie Mills by real estate dealer James H. Smith, and on January 15, 1903, it was acquired from him by Mary Quincy (Gould) Thorndike, the wife of investment banker Albert Thorndike. They previously had lived at 287 Marlborough. They also maintained a home in Weston until about 1918, and then in Nahant. Mary Thorndike died in June of 1927, and Albert Thorndike continued to live at 337 Beacon until his death in August of 1935. After his death, 337 Beacon continued to be the home of the Thorndikes’ unmarried daughters, Mary Quincy Thorndike and Rosanna Duncan Thorndike. They also continued to maintain their home in Nahant. Mary Quincy Thorndike continued to live at 337 Beacon until about 1941. In January of 1941, Rosanna Thorndike went to France to do relief work for the American Friends Service Committee. She worked with the Quakers in Marseilles until November of 1942, when the Germans seized all of France. In January of 1943, she and a number of other Americans were interned in Baden-Baden until February of 1944. 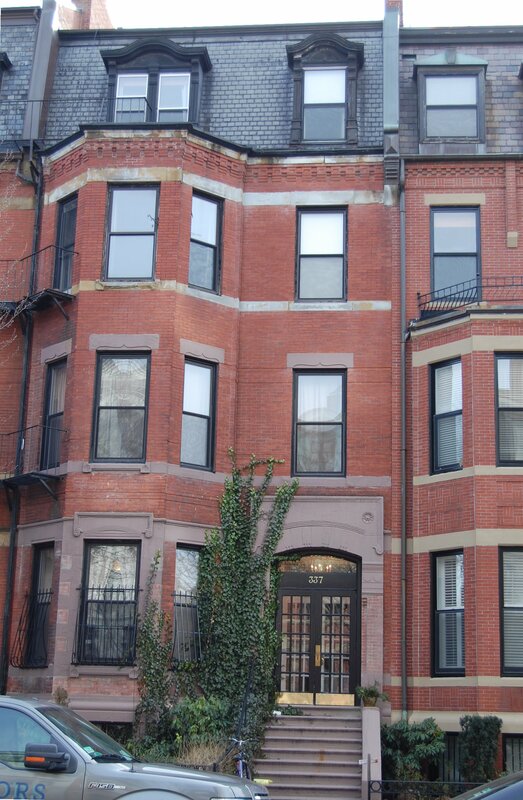 She returned to Boston in March of 1944, and resumed living at 337 Beacon. She moved soon thereafter. On October 2, 1944, 337 Beacon was acquired by Joseph S. Adams (Abrams) and his wife, Syd R. (Peters) Adams. He was eastern manager of Celon Company, manufacturers of bottle caps and seals; she operated the Peters Employment Service. In January of 1950, Syd Adams applied for (and subsequently received) permission to install fire balconies connecting with 335 Beacon. The permit application indicates that 337 Beacon would continue to be a single-family dwelling. By the mid-1950s, however, it had been converted into a lodging house. They continued to live at 337 Beacon in 1954, but moved thereafter. On December 24, 1954, 337 Beacon was acquired from the Adamses by real estate dealers Stuart H. Hastings and Joseph A. Gautreau. In February of 1955, they applied for (and subsequently received) permission to convert the property from a lodging house into nine apartments. The property change hands and on January 2, 1968, was acquired by John Francis Kane, an accountant and real estate developer. 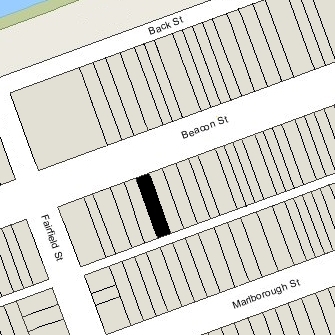 He was unmarried and lived at 385 Marlborough. John Kane died in May of 1989. In his will, he left 337 Beacon to his friend, George Thomas Kennedy. On August 20, 1990, G. Thomas Kennedy transferred the property to the GTK Real Estate Trust, of which he was the sole beneficiary, with Philip S. Olsen as trustee. On July 8, 1994, 337 Beacon was purchased from the GTK Realty Trust by Peter Yaffe, trustee of the 337 Beacon Realty Trust. 337 Beacon remained an apartment building in 2016.